I am currently a customer of Google Fi, FreedomPop and Republic Wireless -- three different services across three different phones. Why? In a nutshell, I analyzed the needs and anticipated cellular usage of each family member and matched this against the most affordable cellular service for that person. The monthly savings I get by doing this is less than $20 so there is something to be said for the simplicity of going with one provider and getting one phone bill. For me, though, there was a certain delight involved in identifying the most cost effective options and, as a result, saving enough per year to cover the cost of a smartphone or two. I get a good feeling every month when my wife's phone bill comes in (typically around $16 for one month). All three services together cost me about $50 per month. Republic Wireless - How has it changed? If you're not familiar with Republic Wireless then you might be interested in a previous summary of the company's offerings here. In short, the company got started by offering $19 per month for unlimited cellular service (talk, text, data) and later switched to a pay-for-what-you-use model that rewarded people who were frugal with cellular data use. The standout feature of this plan was a direct cash refund of any data not used. This is the plan my wife is on and this is the reason her monthly bill averages $16. There remain some notable benefits for certain users. For example, if you have excellent WiFi coverage and no need for cellular data you can get a $15 per month plan that includes unlimited cellular talk and text as well as WiFi data ability. Not bad but the previous RW plan included unlimited talk and text, WiFi data ability and 500MB of cellular data for the same $15. Not only that, but if you managed to use no cellular data under the old plan your monthly bill would automatically drop to $10 as you'd get a $5 credit the following month. Under the new plans, if you need even a *little* cellular data you have to bump up to the $20 plan which includes 1GB of data but no credit if you use less than 1GB of data. That plan is on par with FreedomPop's $20 plan but is still better than Google Fi's plan which would only provide 500MB of data at the $20 mark. The sweet spot for RW is the $25 plan which includes 2GB of cellular data. This also matches FreedomPop's rate for 2GB. Google Fi provides only 1GB of data at the $25 rate. RW also allows you to bring your own device -- as long as it's one that is explicitly supported as you are required to install the RW android app. FreedomPop also allows you to bring your own GSM-based (SIM card) device but for a much larger range of phones via a "global SIM kit" option (one-time cost of $5 for the SIM card). Google Fi has a SIM-card-only option but the range of supported devices is even smaller than Republic Wireless' offerings. "Lowest cost" is relative to your needs. If you have no desire for cellular data then you're considering very different plans compared to someone who needs to stream video whether WiFi is available or not. That said, the absolute lowest cost cellular service that includes talk and text is FreedomPop's "free" plan. This plan is limited to 200 minutes of talk, 500 text messages, and 500MB of cellular data. This free plan is a fantastic option for someone with limited cellular needs or just to have as a backup phone. Imagine being able to send a budget "loaner" phone along with your 8-year-old on a field trip. Even better, install a free security app such as Lookout which allows you to log into a website and track your 8-year-old's location during the field trip. You can, of course, upgrade the "free" plan to a paid plan for more minutes/text/data at any time. You can also elect to downgrade back to the "free" plan at any time. 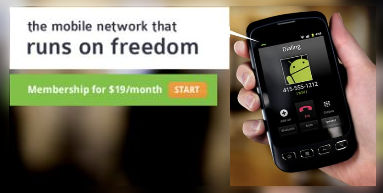 A typical FreedomPop signup will automatically put you on a "premuim" paid plan with the first month of premium services provided for free. To get the free plan, you have to log into the FreedomPop website after your phone is activated and downgrade to the free plan. FreedomPop ties your account to an email address. Each account can only have one phone number. I imagine this is how FreedomPop discourages someone from signing up for multiple free accounts. If you want multiple family members to have FreedomPop service you'll have to create multiple accounts with each account linked to a different email address.